Osteomyelitis in the preantibiotic era often caused death or severe disability. Currently, osteomyelitis remains a relatively common problem but with a much better prognosis. The natural history of osteomyelitis depends upon the virulence of the organism, the resistance of the host, and the age of onset. Virulent organisms may cause the death of a child due to overwhelming sepsis or, if localized, osteomyelitis progresses to chronic osteomyelitis. Osteomyelitis develops through stages, which include bone and soft tissue abscesses causing sequestrum formation, intermittent drainage, and a lifelong disability. Chronic drainage may lead to development of squamous cell carcinoma of the sinus tracts during adult life. Acute osteomyelitis in children produces local pain, swelling, warmth, erythema, tenderness, and systemic manifestations of fever and malaise. Laboratory findings usually include a leukocytosis and elevated CRP and ESR. The CRP and ESR elevations are the most consistent laboratory findings. Image with conventional radiographs to provide a baseline, and assess for soft tissue swelling. A bone scan may be useful in localizing the site of involvement. Ultrasound and MRI studies may be helpful in localizing any abscess. To isolate the organism, culture the blood and consider aspirating the site of infection. Aspiration is most successful if a subperiosteal abscess is present. Management When planning management, estimate the stage of the disease. Antibiotic treatment is usually successful without the need for drainage if the osteomyelitis is discovered early before suppuration has occurred. Start antibiotic treatment while awaiting the results of the cultures. Agent selection is done empirically, taking into consideration the age of the patient and the presence of any special features. Antibiotics are first given parenterally to ensure effective blood levels. The clinical course is monitored. If the antibiotic is effective against the organism and no suppuration is present, clinical improvement will occur with reduction in local signs of inflammation and systemic manifestations. If such improvement fails to occur over a period of 24–48 hours, the most likely cause is the formation of an abscess. An abscess requires operative drainage. Subacute osteomyelitis is an infection with a duration longer than 2–3 weeks. Often this type of osteomyelitis is the residual of acute osteomyelitis that has been contained but not eradicated. The child may show no or little systemic response but experience local swelling, warmth, and tenderness. Sometimes the complaint concerns a limp. Evaluation Radiographs will show the lesion. The appearance will be variable and may be confused with a primary bone tumor, especially when diaphyseal and showing periosteal elevation. The differentiation between infection and Ewing sarcoma or leukemia is usually not difficult. Management Manage classic metaphyseal lesions by antibiotic treatment without drainage. Drain and culture if lesions are atypical, if concern exists about a neoplastic etiology, if the child is immunologically impaired, or if the lesion or symptoms persist following antibiotic treatment. Untreated acute osteomyelitis usually becomes chronic, with the disease localized to a segment of bone. Long bones are most likely to develop chronic osteomyelitis, as a segment of cortex may be devascularized to form a sequestrum. Flat bones, such as those of the pelvis, are primarily cancellous, with better blood supply, and less likely to develop chronic disease. The patterns of chronic osteomyelitis are numerous. Management requires operative sequestrectomy and resection of infected tissue by saucerization to allow filling of the dead space with viable tissue. In very long-standing infections, complex sinus tracts may develop. Assess the condition preoperatively with MRI, CT scans, and possibly by contrast injection of the sinus tract to determine its location, path, and the depth of the sinus. Before resection, consider injecting dye into the sinus to stain the infected tissue. Plan the operative approach that will allow excision of all infected tissue. Provide antibiotic coverage based on preoperative sinus cultures. If the periosteum is viable, new bone will fill in the surgically created bony defect. Osteomyelitis presents in many forms. Abscesses may be extensive, involving bone and adjacent soft tissues, or localized. Localized bone abscesses are often subacute infections that are contained but not eradicated. Chronic infections are often associated with sequestration of dead bone, requiring removal. Before surgery, attempt to localize the bone and soft tissues abscess by careful examination, ultrasound, or needle aspiration. Expose the cortex over the suspected site of the abscess. Look for sites of cortical erosion and spontaneous medullary abscess drainage by observation or probing with a curette. If the cortex is intact, explore by making drill holes. Remove the drill and observe the drainage. If the drainage is purulent, window the cortex to provide better drainage. If only blood drains, explore with additional drill holes until the site of abscess is found. Window the cortex with a small osteotome. Avoid penetrating the growth plate by imaging if necessary. Avoid an excessively large window to reduce the risk of pathological fracture. Gently curette the medullary cavity to ensure complete drainage. Place a drain and perform a limited wound closure. Immobilize in a well-padded cast that extends above the knee for distal femur or upper tibia or below the knee for ankle or foot procedures. Often these lesions are effectively managed by antibiotic treatment alone. Simple direct drainage is indicated if the diagnosis is uncertain or the lesion is refractory to antibiotic treatment alone, painful, or causes systemic signs. Make a simple direct approach and drain the bony abscess. Usually, a sequestrum is present. Sequestra may be subperiosteal, cortical, or medullary. Identify preoperatively with imaging. CT scans are usually indicated. Manage most by sequestrectomy and saucerization. Sometimes bone grafting is performed; however, in most cases fill the space with adjacent muscle. Consider the need for sending a specimen to pathology, as sometimes tumors and infection are confused. If bone resection is significant, immobilize with a cast to prevent fracture. Continue antibiotic treatment until the ESR becomes normal. Systemic complications Untreated osteomyelitis may lead to systemic infections such as bronchopneumonia and septic pericarditis with life-threatening consequences. Local complications are uncommon with current treatment. Complications due to deformity of bone can usually be reconstructed with a satisfactory outcome. This is in contrast to the complications of septic arthritis, which often damage joints with no satisfactory reconstruction usually possible. Pathological fracture is a serious complication of osteomyelitis. Often the extent of the deossification is not appreciated, and the child is discharged with the affected limb unprotected. Pathological fractures are slow to heal and may heal in a deformed position. 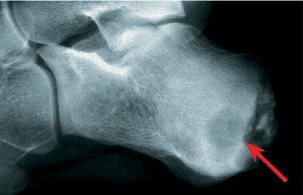 The deossification resulting from osteomyelitis lags the activity of the infection by 2–3 weeks. The risk of pathological fracture should be anticipated, and a protective cast should be applied before the deossification occurs. Sequestrum formation is usually due to delay in diagnosis. Sequestrectomy is usually effective and curative for chronic disease. Growth disturbance may be due to initial damage from the infection or operative drainage. Infections that destroy the growth plate or epiphysis may cause significant deformity.